Riviera Cancun transports you to a world of classic Caribbean beauty, complete with white sand beaches, palm trees and turquoise waters. There’s no shortage of things to see here, as the coastline is surrounded by lively towns, beautiful eco parks and fascinating ancient ruins, making it perfect for couples, families and solo adventurers alike. Cancun is just half an hour north, where you’ll find a lively yet stylish town full of swish bars and modern shopping malls. Or, head to Playa Del Carmen, which is renowned as one of the trendiest towns in the area, thanks to its chic bars and restaurants and excellent golfing at El Camaleon Mayakoba Golf Club. Riviera Cancun also offers some world class diving sites, where colourful coral reefs, shipwrecks and an eerie underwater collection of statues are waiting to be discovered. If you prefer to stay on dry land, be sure to explore the many ancient ruins that Mexico is famous for, such as the iconic Chichen Itza, which is one of the seven wonders of the world. Luxury holidays in Riviera Cancun promise to inspire with stunning beaches, archaeological wonders and incredible coral reefs. Relax on the beach with a refreshing cocktail, or opt to visit nearby Playa Del Carmen for upmarket shopping, restaurants and bars. Explore some of the top sights on the Yucatan Peninsula, such as the famous ancient Mayan city of Chichen Itza, or opt to go diving in the perfect Caribbean waters. 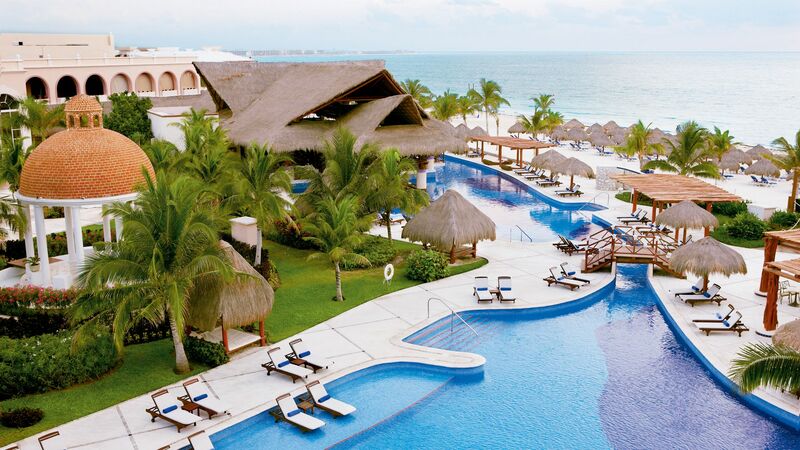 Sovereign recommends a stay at the fabulous Excellence Riviera Cancun. This adults’ only resort offers a romantic and luxurious getaway with beautiful views over the ocean. Here, you’ll find six swimming pools, nine restaurants and a gorgeous spa with al fresco treatments. 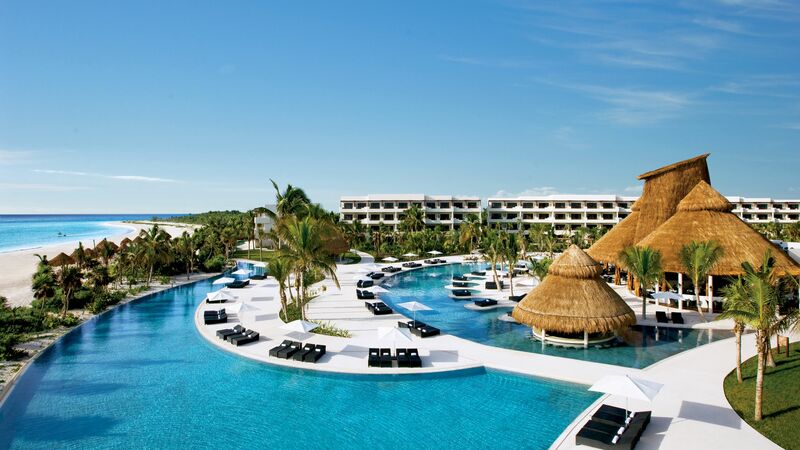 Alternatively, choose the Secrets Maroma Beach Riviera Cancun. Set on a secluded strip of white sand beach, this hotel offers another incredible choice for a romantic holiday. Your stay includes dining at the hotel’s selection of gourmet restaurants and premium wines, and all suites even provide a Jacuzzi for two. Within an hour and a half of the resort’s blissful beaches is one of Mexico’s must-see sites. Chichen Itza is one of the new Seven Wonders of the World; an ancient Mayan archaeological site featuring the famous pyramid-shaped Mayan temple, El Castillo. Golf fanatics, you’re in the right place. The Riviera Cancun Golf Club is one of the newest additions to the area: an 18-hole course that navigates dunes, mangroves and lakes with sea views. There’s also a golf academy and professional tuition for brushing up your skills. Transfer time from Cancun airport to the Riviera Cancun is approximately 25 minutes.